Dwayne was born and raised on a crop-livestock farm near Marshalltown, Iowa and attended grade and high school in the Green Mountain, IA public schools, graduating in 1943. 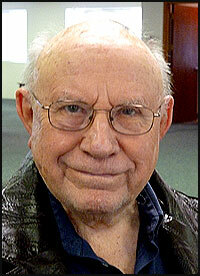 He attended Marshall- town Junior College and Iowa State College graduating with a BS degree in March 1948. Wilma and Dwayne were married in December 1948 and adopted two children. Dwayne embarked on a 40 year adult education career on April 1, 1948 with Iowa State College and the USDA Cooperative Extension Service. For seven years he worked in three Iowa counties as County Extension Director. His crop/soil education and research work in the last county culminated in the establishment of an Experimental Farm in Northwest Iowa. The Agronomy Department asked Dwayne to return to ISC, now ISU, for work on MS and PhD degrees during which time he served as an Area extension Agronomist and Extension Agronomist in Iowa. In 1963, he was employed as an Extension Agronomist and as an Associate Professor by the UW-Madison College of Agriculture and Cooperative Extension Service with responsibility for forage programs in Wisconsin. During the period 1967 to 1969, he served as an agronomist and later Chief of Party on the UW-CALS/USAID Contract team in Southern Brazil with the objectives of establishing graduate programs at the Masters level and a research program in the Federal University of Rio Grande do Sul -- Porto Alegre, Brasil. Today it is a graduate program at the PhD level and trains many of the research and teaching personnel in South America. Returning to Madison, he was given a split extension-research appointment. He chaired a committee that developed and adopted a new method of evaluating forage quality that has been adopted world wide and also chaired the UW Faculty Council that merged the tenure systems of the UW and the State University System institutions. During his career, Dwayne trained 17 graduate students at the MS level and 1 at the PhD level. He has over 200 publications and received Fellow Awards in the American Society of Agronomy and the Crop Science Society of Agronomy. Following retirement, Dwayne served as a Consultant for Growmaark Inc, a cooperative of the Farm Bureau in Iowa, Illinois, Wisconsin, and Ontario, Canada for ten years. He has worked as a Consultant and Educator in the United States, Alberta and Ontario, Canada, Italy, Lativia, Estonia, and Armenia. The Rohweders have traveled in South America, Russia, Europe, Australia, New Zealand, and Alaska. Wilma and Dwayne owned a home, on a golf course, in Sun Lakes, AZ for 16 years and returned to Middleton in 2000. He has been a Kiwanis member for 48 years serving as club officers, President of Wisconsin Retired educators Assn, and the Woodcreek Village Condo Assn. Hobbies include Barber shop singing, leading public singing, photography, golf and model railroading. Dwayne passed away on December 8, 2018. Go here for obituary.